It is certainly fair to say that 1959 was a pretty good year for the world of baseball cards. Topps issued its flagship set with an iconic design, and fans also had the opportunity to build a few sets that entered the market for the first time. This list examines the entirety of the releases from 1959 and highlights the top appearances from those sets. The most notable and popular release of 1959 is, of course, the Topps flagship set. It was the company's largest product to that point with 572 cards and collectors can track down many card-back color variations throughout the checklist. The set is best known for its design which places the players in a cut-out circle with their name in a lowercase font above the photo. The lead-off card in 1959 Topps is Ford Frick who was the Commission of Baseball at the time and famous for helping establish the Baseball Hall of Fame. The set also features two rookie cards of future Hall of Fame members (more on that in the list) as well as several fan-favorite players, including Norm Cash, Jim Perry, Bob Allison, Mike Cuellar, and Felipe Alou. Shop for Professionally Graded 1959 Baseball Cards on eBay. Topps also looked to expand their brand's popularity by printing a set designed specifically for the Venezuelan market. These cards are identical in design to their main set with a few small changes on the back of the card. The card quality was much lower than the American release, making them very hard to find in high grade many decades later. In addition, Topps issued a small, 23-card set on boxes of Bazooka bubble gum in 1959. The cards were worked into the design of the box so collectors had to use their best scissor skills to get the cards out in good condition. A single penny would get you some gum and a card. If you happen to have a complete box without the card cut out, they are worth significantly more. The biggest competition to Topps' baseball card monopoly was orchestrated by Fleer who signed one of the sport's biggest stars in Ted Williams and designed an 80-card set that chronicles his life. One card in the set, #68, has become infamous because Fleer had to remove it from the product. The card in question featured Boston Red Sox General Manager Bucky Harris, who was signed with Topps. Collectors were frustrated by not being able to pull it from packs and those who wrote to Fleer were able to get the card sent to them. To promote an upcoming Home Run Derby TV show, American Motor Company, maker of the Gremlin and Pacer, issued a 20-card, black-and-white set featuring some of the top sluggers in the game. The key cards from the set include Hank Aaron, Willie Mays and Mickey Mantle. 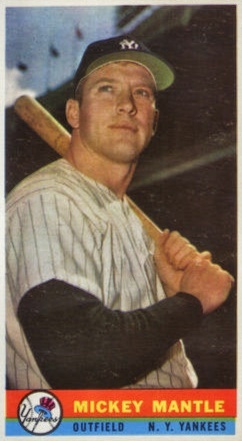 Proving anything with Mantle became a collector's item, a postcard issued as a promotion for the Holiday Inn motels featuring the Yankees slugger has become a unique collectible. Another notable Mantle appearance from 1959 includes a set issued by the Oklahoma Today magazine. The set features notable players from Oklahoma—Mantle being the state's favorite son—and the cards were printed on the back cover of the magazine. Warren Spahn and Dizzy Dean are among the other notable choices. Like previous years, baseball cards related to food products remained a viable alternative for collectors. Carling Beer continued their yearly set focusing on the Cleveland Indians with the highlight being a rarer Billy Martin card. A bakery in Canada called Dad's Cookies took initiative and bought some blank-backed Exhibits Salutations cards and then added their own advertisement on the back. The top cards in that set are for Hank Aaron and Mickey Mantle. Sticking with food sets, a meat company in California (Morrell Meats) created a dozen Los Angeles Dodgers cards with the most sought-after cards featuring Sandy Koufax and Don Drysdale. Kahn's Wieners issued their largest set to date with players from three teams: the Cleveland Indians, Pittsburgh Pirates, and Cincinnati Reds. Lastly, Yoo-Hoo, the chocolate beverage, featured New York Yankees on five cards. Although Mickey Mantle wasn't included in the small card set, he was one of the players whose face was found under the bottle cap, making them incredibly popular. For the first time since Bowman stopped issuing cards in 1955, we have cards outside of the main Topps flagship set cracking the best options for the year. In determining placement on the list, a key factor used was historical importance along with the card's value. Click on the card titles or images to shop for specific cards on eBay. Linked players in the descriptions go directly to card guides. Unless you are an astute fan of baseball history, you might not know that Hall of Fame manager George "Sparky" Anderson had a brief, one-season playing career with the Philadelphia Phillies. At the time, he would have certainly been an unlikely selection as a future HOF member, yet he is just one of two Hall of Famers with a rookie card in 1959 Topps. Anderson would earn his trip to Cooperstown by managing the Cincinnati Reds to back-to-back World Series titles. He later went to the Detroit Tigers and captured another World Series crown, becoming the first skipper to win World Series titles in both leagues. 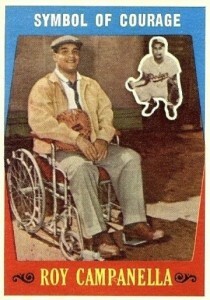 Honoring Brooklyn Dodgers catcher Roy Campanella, the 1959 Topps high-series card highlighted Campanella's remarkable recovery from a career-ending automobile accident. The back contains a statement by National League President Warren Giles and he writes about what a powerful inspiration Campanella is with his hard work and dedication during his recovery. The card serves as a nice end-cap to a remarkable career for "Campy," who had many other noteworthy baseball card appearances. The first of two cards in the list that are not from the main Topps set is Hank Aaron's appearance in 1959 Bazooka. The cards in the release are tall to accommodate the packaging of the Bazooka bubble gum, which was Topps' most famous food product. 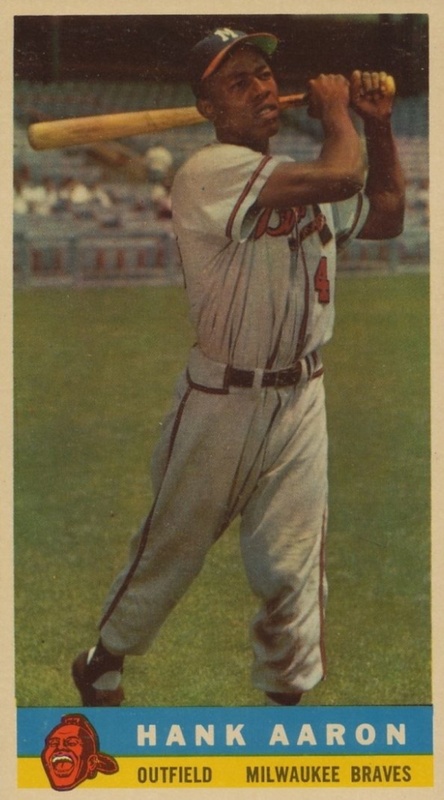 While the 1959 Topps design of the cut-out circle made full-body photographs of players nearly impossible, the taller Bazooka design allowed for a complete shot of Aaron swinging the bat. Aaron's card is also the only one in the set with a color variation as you can find versions with his name printed in either white or yellow. Roberto Clemente was the type of player that seemingly never had a bad baseball card. 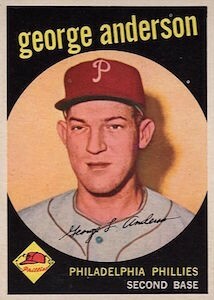 His 1959 Topps is no exception with his hat a little off center as he looks away from the camera. Roberto's signature is placed vertically along the side of his face which makes it a little atypical but the card remains popular. 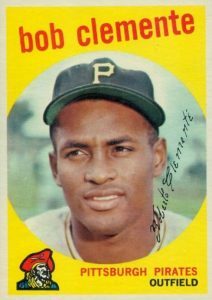 Further increasing interest for Clemente cardboard, his reputation as a humanitarian and role model for kids gives his cards a boost. 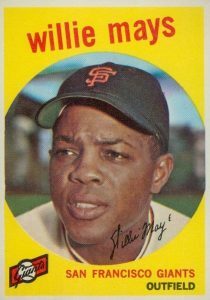 Willie Mays had another successful season in 1958, leading the National League in runs, stolen bases, and for advanced statistics lovers, OPS. As the card's back notes, he lost the NL batting title on the last day of the season to Phillies center fielder Richie Ashburn. Mays' image is framed by a yellow background which has proven to be the strongest color design in the set. As you will see, four of the seven regular-bordered '59 Topps cards in this list feature yellow. Other colors available in the set include black, orange, blue, and pink. 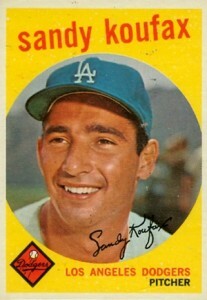 Perhaps my personal favorite card from 1959 Topps, Sandy Koufax's base card that showcases the pitcher sporting a broad smile. Koufax was one of the leading Jewish athletes in America and he practiced his faith seriously. The most well-known example of this came when he decided not to pitch Game 1 of the 1965 World Series against the Minnesota Twins because it fell on a Jewish holiday. The decision was controversial, but the Dodgers still claimed the title with Koufax winning Game 7 on short rest. When the 1959 Bazooka set was originally released, fans could only buy packs with nine different players. 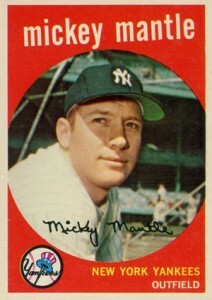 After the product proved to be quite popular, Topps added 14 additional cards, including Mickey Mantle. Over time, collectors have found that more than half of the '59 Bazooka checklist was short-printed. Despite this, it appears that Mantle's card is not among these more limited options. His card is, without question, the most valuable card in the set. Complicating this slightly, condition varies greatly from example to example because cards were hand-cut from the boxes. 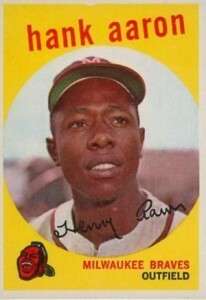 Hank Aaron was featured on four different cards in the 1959 Topps set. Along with his yellow base card below, he also has a red-bordered All-Star card. In addition, there is a Baseball Thrills card highlighting his 1957 World Series performance and a Fence Busters combination card with teammate Eddie Mathews. Topps put their big gun near the start of 1959 Topps with Mantle sitting at card #10. Mantle also has a Baseball Thrills and an All-Star card but it's his vivid base card that commands top prices. Coming off back-to-back MVP seasons, Mantle was bound to have a slower season eventually. However, even though his batting average dropped a bit in 1958, he led the AL in home runs and runs. It takes a pretty big card to unseat Mickey Mantle as the king of the hobby during this era, but Bob Gibson's rookie manages this feat. 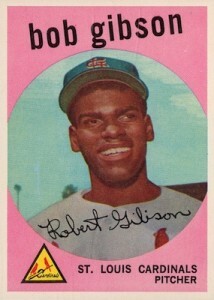 The second of two Hall of Fame rookie cards in 1959 Topps, Gibson would take a few more seasons before becoming a star, winning two Cy Young Awards and a National League MVP. A notoriously hard card to find in mint or gem mint condition, near-mint/mint graded versions can top $2,500 at auction. The card also gets a value boost by being a part of the rarer, high-numbered series. I have a 1959 N.L. Hitting Kings #317 Ashburn-Mays card with a Willy Mays signature on it. I don’t know how to rate the card but its in good shape with a bend on the left hand edge. If the signature is valid could you give me a ballpark figure on how much this card could be worth. I bought it from a gentleman who said it was passed down to him.